Enbridge had a nice growth this past year. If you combine that with its dividends, it makes for a nice investment. How do you like this chart? 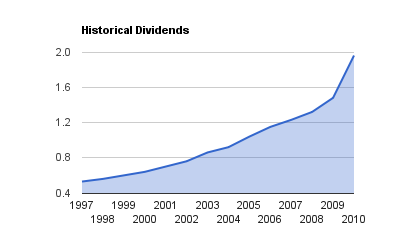 13 increases in the past 13 years and an annual average dividend growth of 11% for those 13 years. Unfortunately, it was flat for 10 years prior to that and a little inconsistent with its growth before that. It has, however, paid dividends for 58 years with no drop in dividends. It highlights their commitment to pay dividends. Enbridge targets a 60%-70% payout ratio. In the past 10 years, it has done quite well to keep their payout in line with their targets. 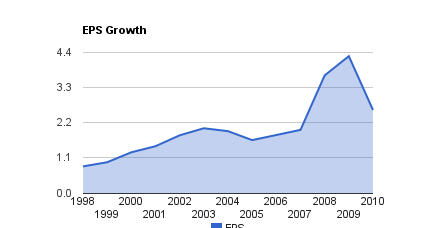 The EPS growth is actually nice. Even though it suffered a drop this past year, you can still see a linear growth. ENB has a P/E of 22 which is a little above the sector average of 20 but not too far from the pack. Enbridge is a Canadian Dividend Aristocrats and investor friendly with its healthy dividends. Its business model is recession proof but not incident proof unfortunately. There is always a risk that an incident can cost them money and that translates in a step back for investors. The stability of the business and the healthy dividends make Enbridge a solid 'boring' investment. Readers: Do you feel Enbridge has a place in your portfolio? Full Disclosure: At the time of writing I am long ENB.